The specially curated summer cocktails are a refreshing take on the regular bases. Drunk In Love was so light with a combination of fresh ingredients including white wine, elderflower essence, cucumber, mint and tonic water. We trusted the bartender on this one, and loved how well it held up. Served in a cute black-and-white patterned tea pot with a cup set, it had a pleasant smoky flavour spiced with star anise. With gin, gooseberry juice and elderflower, it had us in good spirits almost automatically. Exotic appeal at its best! This was a striking pick from their summer cocktails menu with a blend of blueberry-infused scotch whiskey, fresh blueberry pulp and lime juice. It was the perfect balance of tang and bitterness. This is Lock & Key’s highly recommended signature cocktail and had us feeling heady, stat. A sumptuous mix of bourbon whiskey, Islay whisky, homemade honey and pomegranate syrup along with some egg whites! Light and healthy never has to be boring! This salad is perfect for when you want to give your tummy a day off, with layers of watermelon marinated with mint and basil dressing, garnished with some organic pine nuts and feta cheese, then drizzled with a balsamic reduction on a bed of lettuce. With a fusion of flavours from the East and the West, this was an unusual serving with crab cakes spiked with a Bengali twist. Nonetheless, a delightful surprise with its tangy flavour with a hint of fennel seeds accompanied with mustard dip and lemon for additional taste. Prepare to gorge on this guy, as the portions are enough to easily satisfy two. The croquette is a delicious combo of beetroot, oats, zucchini, carrot and savoury spices. And, how could one do a burger without some chips, onion rings, tomato sauce and mustard dip! The dessert menu is stylistic versatility personified. The comfortable base of vanilla ice cream topped with luscious, warm cigars made out of minced date and sesame seeds, rolled out in pastry sheets and deep fried. Catching up with old friends or going on a date with your SO? 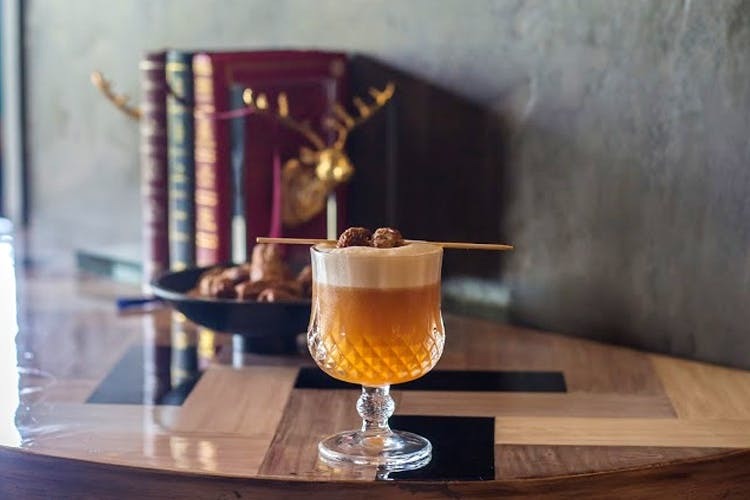 A visit to Lock & Key is a definite bookmark in our diaries. What also caught our attention was the menu’s dedicated sections on gluten-free and vegan option. With a fabulous ambiance and calendar of live events everyday, it's definitely a place to pencil in. #LBBTip: Their warm hospitality is noticeable at every step of the way - trust the bartender and their manager to offer the best of options, suited to individual preferences, for a smooth sail through their innovative presentation.